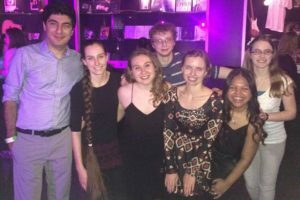 Looking for a fun evening of dancing and meeting new people? Want to learn to handle yourself a little more confidently on the dance floor without getting too technical? These lessons are your best bet! The weekly social lesson is tailored to those with little-to-no previous partner dance experience. 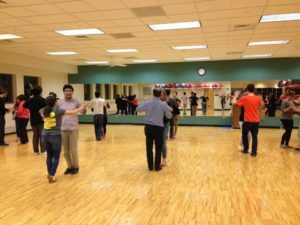 You will learn the basic moves of most of the major ballroom dances including Cha Cha, Tango, and East Coast Swing, as well as other social dances including West Coast Swing, Night Club Two-step, Salsa, and Bachata. You will have the opportunity to get to know many other Notre Dame and SMC students in a fun, friendly environment! 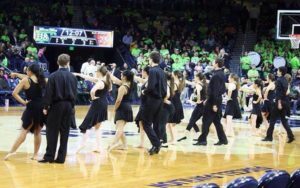 Our American style lessons include American smooth dances (Waltz, Tango, Foxtrot, and Viennese Waltz) as well as American rhythm dances (Cha Cha, Rumba, Swing, and Mambo). We offer both beginner (newcomer) level classes for those who are just starting to dabble in dance and advanced (bronze and above) level classes for those who are a little more confident on the dance floor. Even if you have two (or three) left feet, we can help you learn to glide gracefully around the floor. 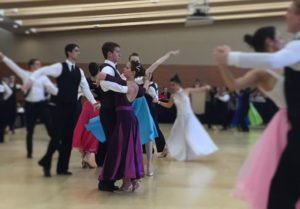 Our dedicated coach Kathy Nate will start from the basics of the dances and focus on the most fun (and challenging) part of ballroom dancing: the connection between leader and follower and the technique that makes this connection strong. These lessons are the most beneficial when attended consistently. Our Latin style lessons include in-depth study of international Cha Cha, international Rumba, Samba, and Jive. Similar to the American lessons, the Latin lessons are offered in both the beginner and advanced levels. Our tireless coach, Mariusz Skonieczny, not only teaches the steps to these fiery dances, but also breaks them down to the basic motions and technique. Weekly attendance as well as a little practice on your own time (even if it’s just in front of your bathroom mirror) is the most effective approach to these lessons. Dues are $25 for one style, $40 for two, $50 for all three styles for one semester or $5 per single lesson.